An award-winning and active member of the grocery community, Mary has been awarded and recognized for her many accomplishments including the ‘2017 Star Women Award’ from Canadian Grocer, the ‘Top Women in Grocery’ award for North America in 2014, and was the first female and grocery retail executive to win the ‘Food Service Excellence Award’ from the Italian Chamber of Commerce in Ontario. Mary serves as a Board Director for the Italian Chamber of Commerce, Board Advisor to Grocery Business, Board Advisor to Inspired Organization for MBA future leaders, Academy Mentor to Women in Food Industry Management, and Mentor Leader to the Network of Executive Women. Recognized as the ‘Go-To’ trusted industry executive, Mary is known as a change agent and the quintessential foodie. 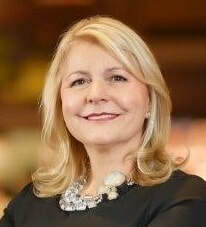 She is recognized for her strategic and tactical leadership in the grocery and food industry. Her broad business expertise spans Merchandising, Multi Banner Operations, Private Label, Innovation Development and Process Management, Governance and New Store Concept Development and Design. Her passion for food has been the driving force of her career, whether it has been identifying new trends or championing innovation. Mary graduated from York University with a Bachelor of Arts in Sociology in 1979. Later she would receive her Strategic Management Certificate from the Schulich School of Business. She just celebrated her 38th wedding anniversary to Pat Dalimonte and they have two daughters: Jennifer and Jacqueline.